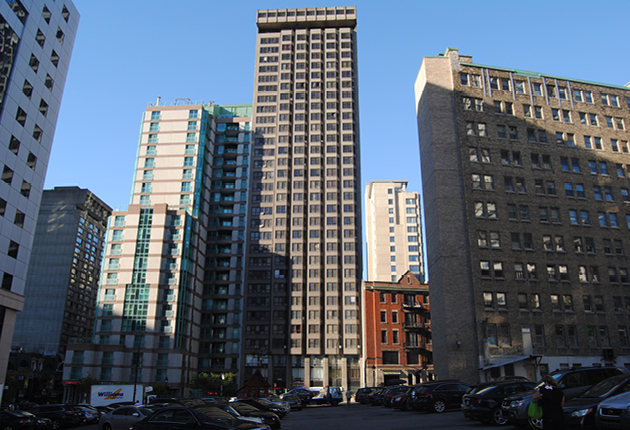 This 33 storey building contains 230 apartments for rent in downtown Montreal. Built in the late '60s, it is beautifully maintained, and located in one of the most vibrant areas of the city in between Sherbrooke and de Maisonneuve Streets. Hospitals, shops, grocery stores, cinemas, nightclubs and restaurants are all located nearby. Its enviable location allows Concordia students to attend their classes in just a few minutes. Meanwhile, public transit users will appreciate the fact they can walk to Guy-Concordia metro station in barely a minute. Less than 5 minutes walk from Concordia university.